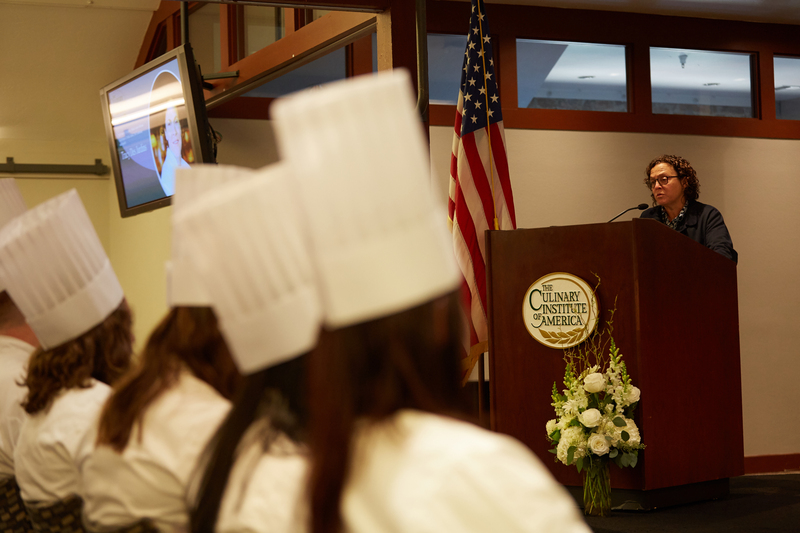 St. Helena, CA – Traci Des Jardins, an iconic figure in the Bay Area restaurant world, delivered the keynote address during commencement at The Culinary Institute of America at Greystone in St. Helena, CA on September 7. Chef Des Jardins is chef and owner of several San Francisco restaurants including her signature Jardinière, which was named Best New Restaurant by Esquire magazine in 1999 and was a finalist for the same honor from the James Beard Foundation. A California native, Chef Des Jardins has been an influential part of the state’s fine-dining scene for the past 25 years, not only earning accolades for herself, but also training numerous young chefs and front-of-the-house leaders. In fact, Jardinière has served as an internship site for CIA students to complete their required field experience. The winner of James Beard Foundation Awards for Rising Star Chef of the Year in 1995 and Best Chef: Pacific in 2007, she was a semifinalist for the Outstanding Chef Award in 2015. Des Jardins was also honored as Chef of the Year by San Francisco magazine in 1995, the same year she made Food & Wine magazine’s list of Best New Chefs. Before opening her own restaurant, Chef Des Jardins cooked at Aqua, Elka, and Rubicon in San Francisco as well as the three-Michelin-star La Maison Troisgros in France, and was executive chef at Joachim Splichal’s Patina in Los Angeles.